Ideal for kids' parties, pool parties and more, these adorable heart-shaped marshmallow gummies can be made any colour of the rainbow with JELL-O Jelly Powder. Add boiling water to jelly powder in medium microwaveable bowl; stir 2 min. until completely dissolved. Stir in marshmallows. Microwave on HIGH 1 min. or until marshmallows are puffed; whisk until marshmallows are completely melted and mixture is well blended. Pour into 9-inch square pan sprayed with cooking spray. Run knife around edge of pan to loosen jelly. 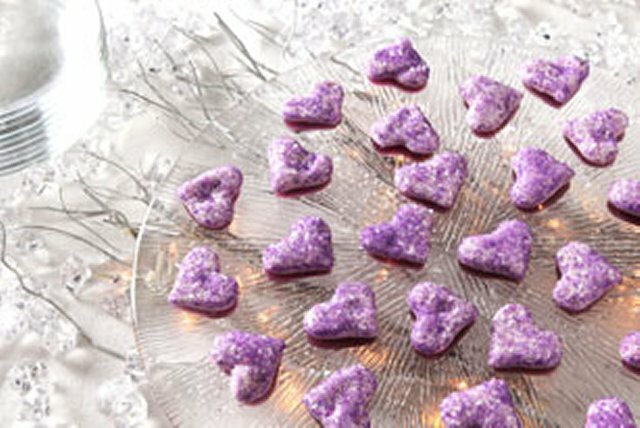 Cut jelly into 32 heart shapes, using 1-inch cookie cutter. Garnish with sprinkles. Prepare using your favourite flavour of Jell-O Jelly Powder. Store in tightly covered container in refrigerator up to 3 days.